Stephen C. has been taught only math and English at a U.S.-run elementary school for Native American children deep in a gorge off the Grand Canyon. Teachers have left midyear, and he repeatedly faces suspension and arrest for behavior his attorneys say is linked to a disability stemming from traumatic experiences. [post_ads]The 12-year-old is among children from Arizona’s remote and impoverished Havasupai reservation who are a step closer to their push for systematic reform of the U.S. agency that oversees tribal education, alleging in a lawsuit it ignored complaints about an understaffed school, a lack of special education and a deficient curriculum. The students’ attorneys say they won a major legal victory recently when a federal court agreed that childhood adversity and trauma can be learning disabilities, a tactic the same law firm used in crime-ridden Compton, California. They say the case could have widespread effects for Native children in more than 180 schools nationwide overseen by the U.S. Bureau of Indian Education and in schools with large Native populations. Havasupai students face adversity and generational trauma from repeated broken promises from the U.S. government, efforts to eradicate Native culture and tradition, discrimination and the school’s tendency to call police to deal with behavioral problems, attorneys say. U.S. District Judge Steven Logan wrote in a late March ruling that the students’ lawyers adequately alleged “complex trauma” and adversity can result in physiological effects leading to a physical impairment. He moved the case forward, denying Justice Department requests to dismiss some of the allegations but agreeing to drop plaintiffs from the lawsuit who no longer attend Havasupai Elementary School. Noshene Ranjbar, an assistant professor of psychiatry at the University of Arizona, said medical literature has expanded in the past 20 years to include trauma that isn’t linked only to singular events. In Native communities she’s worked with in the Dakotas and Arizona, “they agree the root of everything they suffer with is this unresolved grief, loss, trauma, anger, decades of disappointment on a huge scale,” she said. When students act out, schools too often turn to suspension, expulsion or arrest instead of finding what’s driving the bad behavior, she said. Usually, it’s “a hurt human being that is using the wrong means to cope,” Ranjbar said. The Public Counsel law firm pressing the Havasupai case also sued the Compton Unified School District — which is majority black and Latino — in 2015 over disability services for students with complex trauma. A judge said students with violent and traumatic pasts could be eligible for such services but didn’t apply the ruling to all who experience trauma. The U.S. Justice Department did not respond to a request for comment on the Havasupai ruling. Government attorney Cesar Lopez-Morales said at a hearing last year that while trauma could result in a disability, federal agencies cannot assume every Native student with shared experiences is disabled. They would need specifics of individuals’ impairments and how those affect their lives. He said attorneys also failed to show the students were denied benefits solely because of disabilities. Havasupai Elementary School has three teachers for kindergarten through eighth grade on a remote reservation home to about 650 people and world-renowned for its blue-green waterfalls. The village of Supai can be reached only by mule, foot or helicopter, making it the most isolated of the Bureau of Indian Education’s schools in the Lower 48 states. The reservation doesn’t have a high school. The students’ attorneys say the area is beset with high levels of poverty, unemployment, substance abuse, family violence and low literacy levels. All 70 elementary school students qualify for free or reduced lunch and most are limited in English and math proficiency, and have special education needs. “What we know from the science is that, particularly unaddressed, the impact of trauma can impact the ability to learn, read, think, concentrate and communicate,” Public Counsel attorney Kathryn Eidmann said. The lawsuit seeks to force the government to provide services for special needs, a thorough curriculum, culturally relevant education and staff training to respond to trauma. Stephen C., whose full name is not listed in court documents, enrolled as a kindergartner but can hardly read or write now that he’s in seventh grade. His attorneys say he has an attention deficit disorder and experiences trauma from witnessing alcohol abuse at school and from his relatives being forced into boarding schools. At one point, he pulled a plug out of a computer monitor and faced a federal indictment, the lawsuit says. 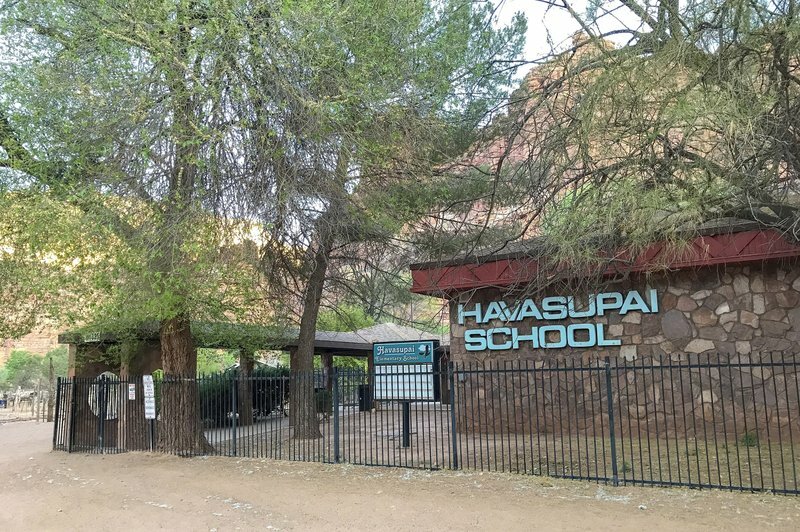 Some Havasupai parents have sent their children to boarding schools off the reservation rather than deal with inadequate educational services. Stephen’s guardian has considered it, too. But he said in a statement that tribal members want children with them in the canyon, to watch them grow and be a part of the community.